Every great city boasts some iconic structure, often piercing the skyline, Paris has the Eiffel Tower, Boston has the Zakim Bridge, London has the London Eye, and soon Providence will have it’s own icon. This parking garage on Weybosset Street. OK, I’m being a little silly, but putting aside for a minute that cars are evil and we should be building thousands of miles of street car lines instead of making more places for people to park, this is actually kinda cool. PROVIDENCE – A Florida company is proposing what may soon be the strangest part of the Providence skyline: a pair of 13-story, translucent parking towers that operate like Ferris wheels, loading cars at the ground level and then moving them high up into the structure for storage. OK, weird, but kind of cool. I keep referring to it as the Pez Dispenser parking garage. I believe the original plan called for it to not be quite so see through, but the Planning Department suggested, and the Downcity Design Review Committee agreed that it should be see through to allow the functions of the mechanism to be apparent. The architect, Providence’s own Friedrich St. Florian encourages people to view the structure not as a building, but as a giant machine. The machine will feature a 3-story liner building on the Weybosset Street side with ground floor retail and I assume office space in the upper floors. 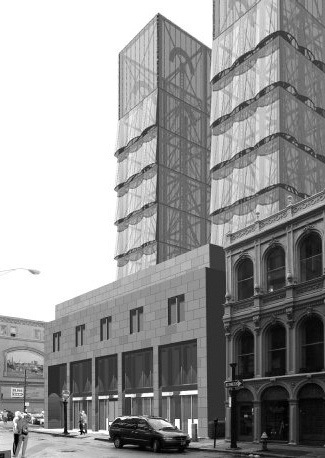 The tower concept is cool, but the liner building is a dud in my opinion, not St. Florian’s finest work. I think any building with a giant Pez Dispenser growing out of it should be of a modern style, but what we see so far is really blah. I’d like to find out what the DRC thought of it. They did send the developer away to come back next month for final approval. Perhaps the most amazing part, the developer Mechanical Vertical Parking Inc. claims the machine (all 13 stories of it) will be complete in 3 months (after start of construction and after final approval by the DRC) and hopes to have it open by this summer. That seems kind of scary to me, even if it is pre-fab, 3 months?! Having lived in Providence from ’68-’02, I recognize the problems with parking. However, building an iconographic “machine” that’s already being referred to as a “Pez dispenser” seems less appropriate than giving more funding to mass transit and making that system work more efficiently and productively. Providence, to me, has been/is a “walking city”. The more space that’s contributed/constructed for parking cars will, ultimately, encourage more cars to come into the city. I would certainly want to see more funding going to mass transit. However, this project is not getting city or state funding. This is a private developer creating a private parking structure, it is not and either/or issue in regards to transit. I would hope that a project like this will be attractive to the monthly parkers that currently exist downtown, such as residents of the Cornish lofts. And that as people move their monthly dollars into this structure and other structured parking options, that we’ll eventually see the scales tip and existing surface lots will be developed. Right now, the cost-benefit analyses on a surface lot does not point towards developing. Surface lots are quite profitable for parking cars still.